Imagine the family tree of the Harmans of Byaduk, with its long branches sweeping far and wide, lush and prosperous. That is except for one. Near the top of the tree sits a small, stunted branch, a mere twig. It is the branch of Alfred Winslow Harman. To me, Alfred Harman is like a shadowy figure standing at the rear of the imaginary Harman family photo. I know little of him and there are no living descendants. Born in Melbourn, Cambridgeshire in 1852, Alfred was a baby when he sailed to Australia with his parents Joseph and Sarah, sister Sarah and brother Walter. He was too young to remember life in England, the arduous journey and the early settlement of the family. Alfred was seven years younger than Walter Harman, his immediate older sibling and 22 years younger than oldest brother James. He probably had more in common with the elder children of his brothers than his brothers themselves. For example, James Harman’s son Reuben James Harman, my gg grandfather was only two years younger than his Uncle Alfred. In his 20s, Alfred headed north to the Wimmera. It was there that he met Alice Jane Miller, daughter of Scots Joseph Bass Miller and Rose Jane Church of Warracknabeal, formerly of South Australia. Alfred and Alice married in 1878 and their only son was born in 1879 at Murtoa. If I keep going on like this, the post will be over in an other paragraph. All I have to say further is that Alfred went to Western Australia, suffered a loss, returned home and passed away! There must be more to add to this branch to give it some life. For the purpose of this post, I decided to search for Alfred again at Trove. With newly digitised papers added regularly, it is worth checking back. This time I directed my search to the surname “Harman” and the places I knew Alfred lived. Starting with “Harman Murtoa”, as I gathered leads I moved to “Harman Rupanyup” and then “Harman Hopetoun”. I searched the decades 1870s, 1880s and 1890s. I then turned my attention to Western Australia where I knew Alfred had lived. I tried “Harman Gwalia”, “Harman Perth”, “Harman Malcolm Street”, “Harman The Crescent” between the years 1900-1930. Thanks to a number of other leads on Alfred and his wife Alice, the story of Alfred Winslow Harman is looking better. Let’s pick up the story again in 1878 with Alfred’s marriage to Alice. Alice Jane Miller was born at Pancharpoo, South Australia in 1859. 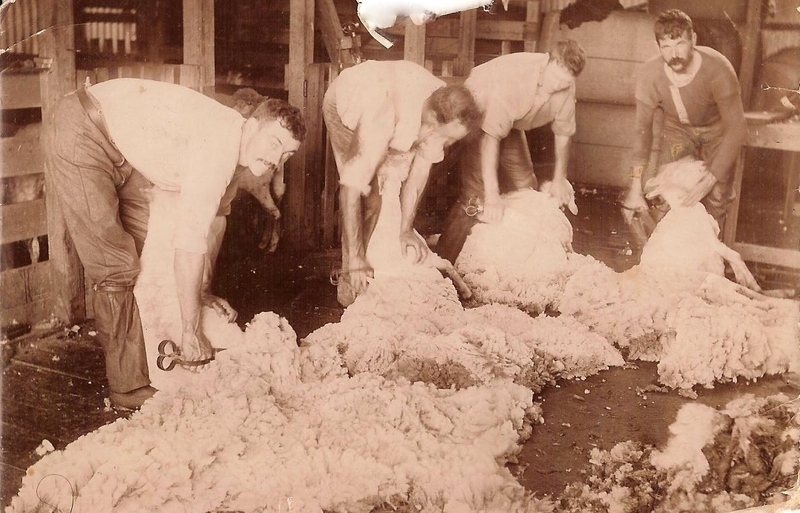 The Millers moved to Warracknabeal sometime after 1868. Alice’s father, Joseph Bass Miller, was an upstanding citizen and the local Justice of the Peace. I have found that while Joseph spelt his name as Miller, some of his children spelt it Millar. In case you are wondering further on in the post. After Alfred and Alice married in 1878, they soon started their family. Herbert Winslow Harman was born at Murtoa in 1879. I am not sure if they were living there or at Rupanyup as newspaper articles found refer to them at both places. There is only 16 kilometres between the two towns. 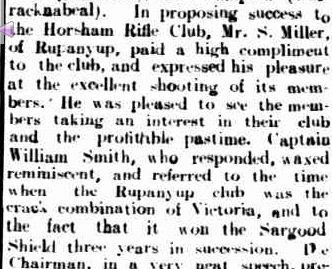 The first newspaper reference I have for the Harmans is from 1883 in a “Horsham Times” report of the Rupanyup and Dunmunkle Society Show. Alice won Best Ironed Gent’s Shirt and Collar. Subsequent articles show Alfred had something of a talent for rifle shooting. Alfred entered many competitions and was a member of the Rupanyup Company of Rangers. In 1886, he and four team mates secured the coveted Sargood Shield, so prized a banquet was held in their honour. 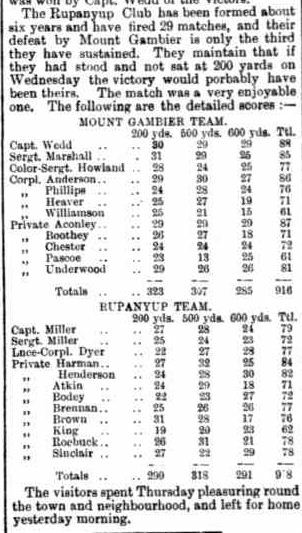 In 1890, the team competed at Mount Gambier, hometown of the Miller boys. It was there they suffered one of their few defeats. Alfred and his family could not have stayed at Hopetoun long, as I found him on the 1903 Electoral Roll at Gwalia, Western Australia. Gwalia was a gold mining town situated over 800 kilometres east of Perth and north of Kalgoorlie. Gold was first mined there in 1897, so the town was in its beginnings when Alfred was there. How the Harmans came to be in Western Australia, especially in the middle of nowhere at Gwalia, I can only guess. Two of Alice’s brothers, Joseph and Josiah Miller also turned up in Western Australia, so there may have been some motivation there. In both 1903 and 1906 on the Gwalia Electoral Roll, Alfred listed his occupation as agent, however in 1906, he is also on the electoral roll for Midland Junction, Perth (commercial traveller) and Francis Street, Perth (traveller). Who knows where he and Alice were actually living at the time? Especially Alice, as she was on the 1903 Electoral Roll at Warracknabeal, the home town of her parents. Did Alfred go ahead or did Alice just fail to change her details? When Alfred and Alice went to the West, their son Herbert, who also went along, was around 20. After only a few years he was working as the manager of the Canada Cycle and Motor Company at Kalgoorlie. In November 1904, tragedy struck when Herbert (Bert) was stricken with Typhoid fever. He passed away in the Perth Hospital on November 20. Alfred and Alice had lost their only child. I noted Warracknabeal was given as the home of Alfred and Alice. As mentioned, Alice’s address was Warracknabeal in 1903, but did Alfred also live there at some time?. The death of Bert also hit the Miller side of the family hard. Joseph Bass Miller Jnr, Alice’s brother was a Health Inspector in Perth. 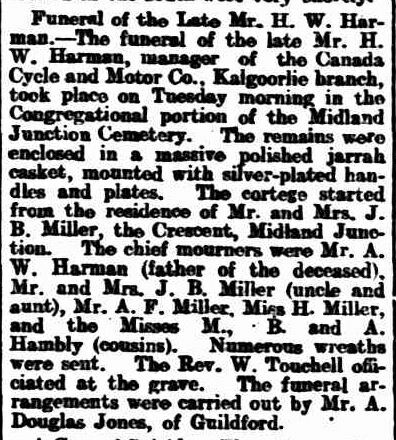 The funeral left his home at The Crescent, Midland Junction. This is just one of the addresses Alfred is listed at on the 1906 Electoral Roll. The funeral of Bert was large with many members of the Miller family in attendance. What interested me in this report was the coffin…”a massive polished jarrah casket, mounted with silver-plated handles and plates”. Either Alfred’s job as a travelling salesman was doing well or the Miller family chipped in. Bert himself had done alright for a 25-year-old, with an estate to the value of £212.00. In 1905, Alice’s mother Rose Church passed away at Warracknabeal and her then 81-year-old father moved to Perth. He passed away in 1908. If I ever wanted to find out where Alfred was living, Electoral Rolls were not going to help. I use Electoral Rolls a lot and I have never seen anyone with multiple entries like Alfred. From 1910 to 1916, Alfred is listed at 71 Malcolm Street, West Perth. That is the only period where Alfred did not have multiple entries. In 1910, Alfred was a collector and in 1916 he was a clerk. In 13 years, he has been an agent, commercial traveller, traveller, an agent again, collector and clerk. After the 1903 Electoral Roll, Alice did not show up again until 1916, living at 71 Malcolm Street, West Perth with Alfred. However, from my search at Trove of “Harman Malcolm Street”, I know Alice was at 71 Malcolm Street in 1914. How? Thanks to this interesting snippet from The Western Australian. 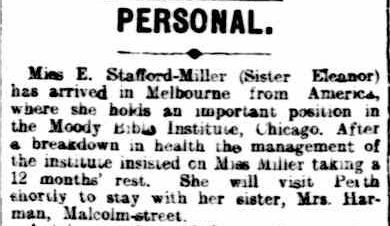 It is a little difficult to read, but what is that about Miss E. Stafford Millar, of Chicago visiting her sister Mrs Harman, of Malcolm Street, Perth? I checked back on the Miller family tree and Elinor Stafford Millar was the sister of Alice. But what about Chicago? Any excuse to get side tracked, I turned to Trove again. A search on Elinor revealed all. Who needs Google? I had seen a photo of Elinor on the family tree of Rachel Boatwright at Ancestry.com.au (one of Rachel’s photos of Alice’s brother William Miller is on January Passing of the Pioneers). I was taken in by the difference between her photo and those of her siblings. Now I know she led a very different life at the Moody Bible Institute in Chicago. 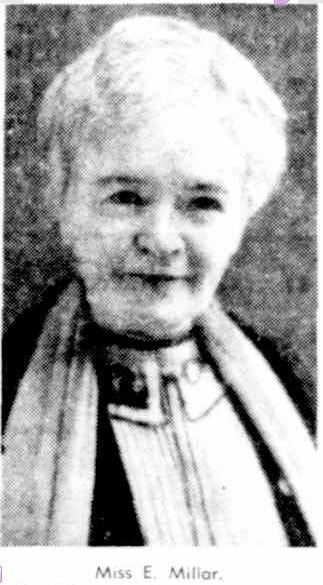 I found another photo of her in the The Advertiser, Adelaide from 1937. Alfred’s next Electoral Roll appearance was in 1925 at 105 Stirling Street, North Perth. But wait, he is also listed at Dumbleyung in Western Australia’s wheat belt, a long way from Perth. At his Perth address he was a clerk, while at Dumbleyung he was retired. No mention of Alice at either address. That was because in 1924, she was on the electoral at 593 Burke Road, Camberwell, Victoria! Further investigation found that this was the address of Alice’s brother Alexander. She is also listed at 27 Aroona Road, Elsternwick on the Electoral Roll from the same year. I don’t know whose house that was! I sometimes wish the Electoral Rolls were like a census, listed by household and not surname. It would make it so much easier to find out who was living with who. Alice appears on the Electoral Roll again in 1931, this time at 15 Torrington Street, Canterbury. But where was Alfred? He was listed over at 50 Downshire Road, Elsternwick of course!. Now why does that address sound familiar? It just happened to be the address of Alfred’s niece, Susan Oakley, daughter of Alfred’s sister Sarah Harman. And that is where it all ended for Alfred, at 50 Downshire Road, Elsternwick on March 22, 1933. He was buried at the Box Hill Cemetery. The link to Susan Oakley, explains why Susan and her husband Robert Cruikshank are mentioned in the family notice. There was only 13 years difference in age between uncle and niece and Susan was living in the Wimmera, including Rupanyup, at the same time as Alfred, which may explain their close relationship. I like to find these links as it gives me some idea of the family dynamic. So what became of Alice? According to the Electoral Roll of 1936, she had moved to the house next door at 17 Torrington Street, Canterbury. She passed away on May 21, 1940 and was buried with Alfred at the Box Hill Cemetery. Thanks to Trove and the digitised newspapers, I was able to take the information I had from Electoral Rolls and obituaries to discover so much more about Alfred’s life. I also found a lot more about the Millers/Millars and that helped work out who was where and when. However, questions still stand, such as exactly where did Alfred and Alice live and what was with all the Electoral Roll entries? I also want to know what Alfred was selling, especially during his time in Gwalia. I will keep checking the newspapers. Alfred’s branch is now looking a little healthier. It will never grow but I think I can see some blossom now. This entry was posted in Harman and tagged Cruikshank, Harman, Miller, Oakley. Bookmark the permalink. Saw a link to this blog post, and asked the Warracknabeal people if they could find anything locally on the Harmans & Millars. Have a few photocopied Herald newspaper articles if you are interested. Thanks for dropping by. Thank you for your efforts to find information on the Harmans/Millars. I would be interested in the articles you have found. Are they scanned? have you seen a copy of Alex & Fran Millars’ book – “The Tale of Two Millers”. It contains photos of both Alf Harman & Herbert Winslow Harman.